This year Lynne has been busy working on a couple of TV programmes - Supersize vs Superskinny and the new series, Secret Eaters. Lynne talks more about tea! Following a recent study which found that tea was just as hydrating as water, Lynne, along with other members of the Tea Advisory Panel, discusses the benefits of tea in more detail. 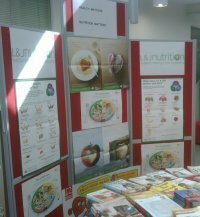 In June, L&J Nutrition were invited back by Kingston University to participate in their annual health fair events. Lynne and Joan's stand was very well attended by participants who wanted to find out more about how their diet could be improved. Lynne's recent involvement in supersize vs superskinny is now being aired on Channel 4, Tuesday at 9pm. disclaimer | sitemap © 2013 Alimenta Ltd. All Rights Reserved.